Synopsis: When the Doctor invents a machine to predict the future, he sees the death of himself and Jo at the hands of the Brigadier. Deciding that separating is the best way to avoid this fate, Jo is sent on assignment to Africa where she discovers a deadly threat is hiding in the desert. Characterization. (Phew, big word) The Doctor is a perfect image of what the character was -- and was portrayed by -- in the Pertwee era. Jo is Jo, and yet more, and even if she gets taken over by alien control, it's still good. She goes through the book dealing with the strife around her and feeling helpless to do anything, but she still tries, shooting guns, helping injured people, ect. She makes for a better character in here than I've ever seen. Not to mention the UNIT team, and definitely the Brig, are top notch, a reminder of how we all wish it was 1972 and we were watching it on TV. Baddies. You look at the cover and see an insect. You look closer and you see helicopter rotors on it! Which is it, alien or aviator? Both! An insect race that can mimic anything. I wonder if this came out before or after the film 'Mimic.' Nevertheless, a great concept, as well as their duplicates and uses of scent. Plot devices and story. Seemingly well paced, and giving it a real life feal with trouble in the Middle East. Politics, terrorists, ruthless governments, not to mention alien control is a spanner in the works here, as well as the Doctor's future telling machine (an odd thing for the Pertwee Doc to do, but still plausible), which foresees his and Jo's death at the hands of the Brigadier. Not a spoiler considering it happens practically at the beginning. Overall -- read this one it's good, except for a couple gratuitous references to have the urge to urinate. (I could never imagine a woman saying "I have to piss") A definite plus and thing to look out for is the Doctor flying a jet, with the Brig in the seat behind. Wonderful stuff! One of the better MAs, given that the only previous novel to feature the Third Doctor was The Ghosts Of N-Space and that itself was a novelisation of a radio play. PLOT: Interesting yet simple and engaging enough to hold the readers attention throughout. The number of deaths however does seem to contradict what Paul Leonard is trying to get across however. THE DOCTOR: Perfectly Pertwee, complete with him trying out various vehicles. COMPANION: Jo here is definitely more grown up, obviously preparing her for her departure in The Green Death; certainly refreshing. OTHERS: UNIT are really the only other characters that stand out, certainly the Brigadier, who is the initial thrust of the storyline. VILLAINS: Well, said villains are in fact an alien race of insects, attacking Kebiria (the desert to you and me). The alien Xarax are at least believable, although they don`t carry the same weight as the Venusians in Leonard`s previous Venusian Lullaby. OVERALL: For the refreshing change of setting, characterisation (especially Jo) and for being a particularly enjoyable novel Dancing The Code gets a deserved 8/10. Does almost nothing for me, I'm afraid. It's not a bad book, but little about it had survived in my memory from the first time I read it. Paul Leonard is clearly fond of the UNIT family, but I've always felt that his two Pertwee MAs are his weakest books. The biggest problem with Dancing the Code is its villains. The Xarax are faceless. They don't speak, think or show any personality or motivation. Our heroes might as well be fighting accelerated global warming or a space plague. The result is a dry, one-sided story with rather hollow action scenes. For a while we have terrorists and other such characters to keep our interest alive, but by the end it's all degenerated into imminent nuclear strikes, lots of helicopters and the Doctor doing something clever with biotech. Sadly technobabble is still technobabble, even if it's done with clever honey instead of nanomachines. There's the Arabian setting, with terrorists and police brutality. What with this and Interference, if I was an Arab I might be getting touchy. It's distinctive and scary, yes, but it's also too Mortimoresque for its own good. Paul Leonard has often been influenced by his friend and fellow writer (and I generally like both of their work), but this is too much. People die, then other people die, then in case we hadn't got the message some more people die. Frankly it's monotonous. It kills the tension. You can't put emotional investment into the characters if you know it's all going to end in senseless death. The regulars didn't work for me. The book poses a central dilemma... "could the Brigadier murder the Doctor and Jo? ", but then doesn't really do anything with it. Of course he could! It's his job! In the end this issue is resolved with the cop-out we saw coming a mile away, when there's still another third of the book to go. The Doctor takes ages to get involved, but I thought Jo in particular never quite clicked. It's a difficulty that's peculiar to Doctor Who novelists... taking a paper-thin character from the TV show, memorable mostly for a pretty face and a charming performance, and then trying to make them work on the page. Paul Leonard went on to use Jo Grant in three novels (Dancing the Code, Speed of Flight and Genocide) and I didn't buy her in any of them. Jo Grant lists some of the aliens she's met on p61, the author rather pathetically adding a few invented names so as not to straitjacket future novelists. However I don't think anyone to date has felt the need to create aliens called Methaji or Hoveet for the sake of tying into a throwaway mention in a mostly forgotten MA... by now I'd be surprised if anyone ever did. At the end of the day, this isn't a bad book. Paul Leonard is a fine writer and he's obviously still trying, but for me there's just too much to distance me from the action. The personality-less alien menace, the never-ending random death, the flat regulars... even the incidental characters couldn't save it, partly because too many of 'em are grim killers and partly because you know they're all doomed anyway. I give this book credit for a wholehearted portrayal of Middle Eastern brutality and horror, but when it comes to the Whoish elements there's not much I'd recommend. In Dancing the Code, Paul Leonard takes the Mawdryn Undead line, making the 1970s the contemporary setting for the third Doctor/UNIT era. To his credit, he has capably recreated the feel of the decade. The novel is part political thriller, featuring international tensions between the Arab world and the west, civil war, celebrity terrorists and the shadow of nuclear annihilation (and, three decades on, everything old is new again!) And look at UNIT: it's finally an international body with all the clout and credibility such an organisation deserves; on screen The Claws of Axos and to a lesser extent The Ambassadors of Death were the only Pertwee stories that gave UNIT this scope. UNIT is also done another long overdue favour. It's personalised. The troops are no longer the faceless cannon fodder extras so casually zapped out of existence by various alien marauders. They're flesh and blood, real people with loved ones, whose individual deaths are rightly treated as tragic. Anton Devereaux left behind a wife and two children; Mike Yates is relieved he doesn't have to inform them of his death. But it probably will be down to him to tell Jenny, Private John Shoregood's partner, that he won't be coming home. So too all the other families: those of Sergeant Dave Green, Barry Ryman, Pepworth, Morgan, Richard Moore and Tim Witchell. The Brigadier knows the number of the UNIT morgue off by heart and it disturbs him. UNIT has never been so human. Our "UNIT family", thankfully minus the Master, are depicted extremely well. Yates is great: when he's in his office, he actually has work to do. And when he's in the field, he's a soldier, seeing action and getting his hands dirty, as he did in much of season 8 and practically never afterwards. Benton gets to carry a good chase/action moment towards the end, and Jo is capable, resourceful and intelligent, very much as she was in The Mind of Evil. The Doctor and Brigadier are by far the best. Their bickering is great, as is the Doctor's constant flouting of authority, delightfully revisited during the flight in the Superhawk; the dialogue between the two is rich and humorous. We even see a deeper, more introspective side to Lethbridge-Stewart as he ponders the implications of the Prognosticator's image of his shooting the Doctor and Jo. The rest of the characters aren't that special, mainly because few of them are fleshed out properly. When they are, in the case of Catriona, they don't succeed for being too uninteresting. Conversely the potentially interesting ones, such as Vincent, the Sakir and his son Tahir, aren't given much examination or depth, and so proper characterisation suffers. But Leonard has a great grasp of drama. As with the UNIT soldiers, individual deaths, even those of unsympathetic and antagonistic characters like Vincent, Benari and Catriona's prison guard, are each a pointless waste of life. The bombing of Free Giltea is the dramatic centrepiece of the book, and the resulting carnage as witnessed by Jo is very sobering indeed. There's also some breath-bating action, the jailbreak in particular. Of course there's an alien threat present, or this wouldn't be Doctor Who: the Xarax. They're well conceived, but not spectacular and not really that memorable. It's when describing them and their habitat that Leonard's normally high standard of writing suffers. Moments inside the interior of their base are often stilted and confusing. The pace also drags in the middle sections, when all the different parties are making their way across various strips of desert. While the fictitious country is quite effectively realised overall, here it lacks a sense of scale. You're not sure how far, or near, everyone is from each other. I also feel that the positioning of the story - between Planet of the Daleks and The Green Death - isn't the best. It would have worked much better during the Doctor's exile. All the journeys to and from Kebiria are by plane. Had this been pre-Three Doctors it would have been the only fast way to travel. In that case the author wouldn;t have had to contrive the rather silly moment on p.71 that puts the TARDIS out of action. It would also have given more edge to the Prognosticator situation. The Doctor reasons the prediction won't be fulfilled if he and Jo separate; but without the option of simply getting in the TARDIS and flying away, the scenario could have had added tension. But on the other hand this is offset by a couple of lovely moments that benefit from its placing: a quite touching bit of eavesdropping on Jo as she reflects on her time with the Doctor. (p.41) Even with the writer's benefit of hindsight, it still makes the foreshadowing of The Green Death very poignant. And on pp.20-21 we learn of the apprehension felt by the Brigadier and Mike that the Doctor will soon leave for good. But at the end of the day, Dancing the Code is a decent read: a great use of the regulars and UNIT with a good period feel. The so-so alien race and the sub-par guest characters don't spoil things too much. The Prognosticator subplot is interesting, but when we learn the Xarax can replicate people, it's obvious the Brigadier will shoot the copies (compare this with the Blake's 7 episode Redemption). But the novel is certainly worth a look. The 1990s saw a plethora of Doctor Who. The TV series might have been over but, under Virgin at least, the series was thriving on the printed page. It was perhaps inevitable that a range would start up featuring the first six Doctors, with writers keen both to recapture a bit of nostalgia while expanding upon the eras in question. 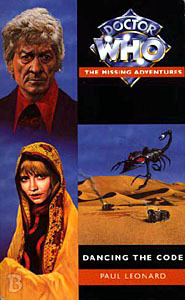 Paul Leonard's Dancing the Code, the ninth book in the Missing Adventures range, is an example of trying to do both at the same time and the dangers in doing so. Let's start with the nostalgia bit first. If, like me, you're a fan of the Third Doctor era on TV, there will be plenty to like about the book. Leonard seems to have a gift for capturing the Third Doctor/Jo/UNIT team of the Season 10 (since the back cover and various internal references set this between Planet of the Daleks and The Green Death). Pertwee's Third Doctor reads particularly well, while Jo, thrown in at the proverbial deep end without the Doctor for much of the novel's length, gets to shine in some heady situations. The Brigadier comes across the best of the returning TV characters, coming across more as a soldier than the comedic foil he became in stories like The Three Doctors. The plot feels very much of the era, with lots of running around, pitched battles and escaping that became the hallmarks of the longer stories of the time. For a Pertwee fan, there's a particular thrill to be found in reading that. Leonard wasn't content just recreating the era. While the New Adventures got the pitch of being "stories too broad and deep for the small screen", works like Dancing the Code prove that was true of Virgin's Who output in general. Set principally in a war-torn African country with cities on the Mediterranian and great desert wastelands, the setting alone would have broken the budget for the show in the early 1970s. Indeed, it's hard to imagine even New Who in the 21st century, with its borderline-cinematic production values, being able to stage the massive battles between flying insects turned helicopters and UNIT with the firepower thrown about in the novel's conclusion. Perhaps Big Finish, having the ability to create soundscapes without having to worry about visuals, could do it. At times the book seems like a fit for their current range of Third Doctor Adventures (minus the Brigadier, of course). That's only at times, however. For the scope isn't the only way in which Leonard expands things. Though the Third Doctor era on TV was arguably Classic Who at its most political, the writers and the production team often did so with allegories or burying things within enough genre context to separate it from the real world of the time. While the country of Kebiria may be fictional, it could well be any number of real post-colonial African countries confronting civil wars, competing visions of the future and tribal politics. It's a heady mixture and one slightly ahead of its time in the idea (explored in later books and audios) of a country's leaders trying to solve their problems by using found extraterrestrial technology. That's a heavy dose of realism that gets added onto by Leonard's descriptions of violence, which is stark and, to some extent, realistic, if not off-putting at times. The problem ultimately becomes what happens when you try to present the fantastical side of the Pertwee/UNIT stories with Leonard's commentary, combined with the verisimilitude of the setting and the violence: it just doesn't quite work. Perhaps, in the end, Dancing the Code is guilty of being too ambitious. It wants to be a part of the Third Doctor era, expanding it while also trying to put it in the real world. While David Bishop did that successfully with Who Killed Kennedy (itself a unique book), Paul Leonard doesn't quite pull off the same trick here. Maybe it's something down to the clash of styles between the fantastic with the real world or, even, the sheer grisliness of his prose, with its depictions of violence. In any case, it's a read that is at once exhilarating and unsatisfying, too little and yet too much at the same. The exile period for the Third Doctor had him working with UNIT, which stood for the United Nations Intelligence Taskforce. You would think that involved working with the United Nations to stop problems, which rarely ever occurred on television. The only two times they dealt with United Nations problems was when they oversaw the security for the peace conference in The Mind of Evil and the missing scientists in The Time Warrior. This changes with Dancing the Code, a story that involves UNIT being used to diffuse a situation in the Middle East as a commentary on the terrorism in the 1980s and 1990s, even though the novel takes place sometime between 1973 and 1974. I won't get into the UNIT Dating controversy here, and this is when the story says it takes place, so I'm keeping it as such. The fictional nation of Kebiria is under civil war between Muslims and Christian, not unlike Israel and Palestine, and a faction of terrorists have discovered an alien army built underneath the capital, which the terrorists are using to try and win the war. It is at this point that we meet journalist Catriona Talliser, who has an interview with the terrorist group where she is told about legends of demons and eventually runs into a UNIT officer who leaks a honey-like substance and mutters "dancing the code". This causes UNIT to get involved where a conspiracy is unraveled about the alien Xarax, a corruption of Xerox, who make copies of people filled with the honey stuff, which will be used to take over the world and reproduce, and it is up to the Doctor and Jo to stop this.  Of course, there is a twist: the Doctor has created a machine to see into the future and has seen the Brigadier, his best friend, shoot him and Jo dead in cold blood with apparently no motivation, which only adds intrigue to the story, as we know that, while the details may be different, the Doctor and Jo will be shot. It shows why you should never know the future, much like The Space Museum, as they can't do anything to change it, but they do the logical thing and split up. Jo takes the dangerous route and goes into Kebiria to help out with Yates investigating the UNIT soldier's death and the strange honey substance. This plot is extremely strong; reading it has a pace that just flies by, unlike Paul Leonard's first novel. I read the novel in the span of the day, and it feels so much like a thrill ride that just doesn't let up, as you want to know all the twists and turns of the novel as things get revealed. Leonard also works extremely well with his cast of characters. It is like they have leapt off the screen and into the pages, much better than The Ghosts of N-Space. This is set firmly after Planet of the Daleks, so the Doctor has freedom and is using UNIT funding for his own special projects; throughout the novel, he just feels like he is being voiced by Jon Pertwee. The double of the Doctor is also creepy, as you don't know when the Doctor is the Doctor and when he is the double, which makes rereading certain passages a real treat. Everything is left so vague, which is the intention, as you aren't supposed to know who is who in what seems to be a comment on the Cold War. If the Doctor was a great representation of his screen counterpart, Jo Grant fares even better, as, instead of being ditzy, she is even more capable, as she is the one trying to figure out what the Xarax wants even after she is infected by them, which I actually find really interesting. She also has an interesting relationship with Vincent, who is a terrorist leader whom she almost falls in love with. It isn't quite love, but it has an extremely interesting dynamic. The entire UNIT family is here in this story and are also impeccably presented. Sergeant Benton gets the least amount of screen time as usual, but, whenever he is on, he is just as lovable as always. Captain Yates gets a much larger portion of the novel devoted to him, as he is paired with Jo for some sections and stays as UNIT's liaison for much of the plot of the story. You can just feel Richard Franklin oozing off the page, which is the same with the Brigadier. We get into the head of the Brigadier, as he doesn't want to shoot the Doctor and Jo, and the thought of it actively horrifies him. It gets even tenser with the Doctor, Jo and several UNIT personnel being replaced with copies a la Invasion of the Body Snatchers, and he can't tell if he actually shoots the Doctor or just a copy. The main problem I have with Dancing the Code is that the thing has way too many characters, which get a bit difficult to remember and I am really trying with it.